​Is the fast fashion industry ready to change its wasteful ways? By midday, the garbage bags full of clothes began to pile up. There were mounds of children's clothes, a suitcase worth of women's underwear, an armful of summer shirts and pants that had gotten a little tight and even dead relative's stained sweater. The several thousand pounds of used clothing, shoes and other textiles collected at this Brooklyn greenmarket on a recent Saturday are part of a small but growing trend to recycle the textiles that would otherwise end up in landfills. Tucked between a compost stand and a clean energy booth on the edge of Prospect Park, this stand attracts a mix of families, seniors and hipsters in their 20s . It's one of 31 locations in New York City that have collected over three million pounds of textiles since 2007. "We're in this consumer culture. With online shopping, everything is constantly in your face, especially at a really good deal. You find waves where you overindulge and you see everything you have and you really don't need everything," said Dana Mortell, who along with her roommate has come to drop off several bags of shoes and clothes. "We live with four girls and the hoarding of clothes is real," said Mortell's roommate, Katie Tagarello, who said she did clothing swaps in college and is "used to giving back to something and reusing it in some way." "We had a big cleaning and it feels so much better to get the clutter out," she continued. "We can look at each individual item and think of what sentimental value it holds to us. But if we never wear it ... it's not what the purpose of the clothes should be, really." Adam Baruchowitz, the CEO of Wearable Collections, which coordinates textile recycling in partnership with GrowNYC, acknowledged these bags of clothes are just a "drop in the bucket." But he and others believe it's part of a growing counterweight what many critics see as the outsized environmental footprint of the fashion industry. Already under fire for production process that use huge amounts of energy and water, the industry is being taken to task for filling their stores with a seemingly unending supply of cheap shirts, pants and dresses without ever considering where the stuff ends up. Just in New York alone, the average person throws out 46 pounds of clothing and textiles every year, which works out to be 193,000 tons for the entire city, according to the nonprofit GrowNYC. Nationally, Americans generate 25 billion pounds of textile waste every year, or about 82 pounds per person, according to the Council for Textile Recycling. And that figure is growing, going from 18.2 billion pounds in 1999 to nearly 25.5 billion pounds in 2009 and as much as 35.4 billion pounds by 2019. Only about 15 percent, or about 4 billion pounds, of clothing gets donated or recycled - much of it sent to markets overseas and the rest either turned into rags or insulation for such things as cars or homes. The rest ends up in our already crowded landfills, representing around 5.2 percent of all the trash generated in the U.S.
Elizabeth Cline, the author of the book "Overdressed: The Shockingly High Price of Cheap Fashion," blames affordable brands like H&M and Forever 21 along with the Internet for creating a culture where shoppers, especially young women, feel compelled to buy more. As a result, she says, a growing percentage of the clothes ending up at the Salvation Army or in garbage bins are "cheap stuff" which "we see as disposable." "There is so much waste being created and that has changed really dramatically in the last 15 years with the rise of fast fashion and disposable consumption," Cline said. "We all are guilty or know someone who is ... of just buying clothes that we only plan to wear a couple of times and we have more clothes than we ever had before. Our clothing consumption is five times higher than it was in the 1980s. The flip side of that coin is that we are creating more waste." Cline said popular clothing brands have figured out how to "leverage the global supply chain" by turning to places like India and Bangladesh to produce their garments faster and cheaper. "They are able to produce clothes more cheaply than ever and they are able produce more styles on ongoing basis," she said. "So where you used to have two to four seasons in fashion, two to four collections in a store in a year, now new styles are coming out constantly throughout the year. You can go into an H&M today and the next week there is going to be a lot of new product in there that isn't there today." The industry insists that fast fashion is simply giving consumers "more choice" and that concerns about its environmental record are overblown. It contends that the numbers of garments purchased each year is down, from 69 per person in 2005 to 63.6 in 2013 - partly, it says, due to the Great Recession that ran from 2007 to 2009. "People are actually buying less than they did 10 years. While there has been a lot of press about [wastefulness], the numbers don't bear that out," said Nate Herman, the vice president of international trade for the American Apparel and Footwear Association. But Herman acknowledged that the industry recognizes that dealing with "end-of-life issues, what happens to the shirt, jacket or pants once the consumer is done with it, is very important." "They are really trying to figure out the best ways to use these products they collect back in the supply chain and working with others to recycle and reuse the materials," Herman said. For some companies, a big part of that push is allowing consumers to return items to a store after they're done with them - often for discounts on new purchases. The brands then team up with companies like I:CO and 2ReWear to recycle the old clothes. Eileen Fisher has a program called Green Eileen, which offers a small store credit when customers trade in used garments. Those that are in nearly-new condition are then sold at the Green Eileen venue; the rest are either donated to women's shelters and charities or recycled. Levi's has expanded its in-store recycling program that takes back any clothes or footwear in exchange for a discount coupon. American Eagle, meanwhile, has partnered with the From Blue to Green denim recycling program to take back old jeans that are then recycled and turned into insulation for hundreds of homes built by Habitat For Humanity as well as Brad Pitt's New Orleans rebuilding project Make It Right. The push to give used clothing a second life has also attracted scores of start-ups that operate like digital Goodwills by allowing consumers to buy, swap and recycle clothes over the Internet. Many of them, like Bib + Tuck, The RealReal, Shop Hers, Tradesy and ThredUp cater to fashion-conscious women and feature plenty of designer brands. Anthony Marino, the chief marketing officer for ThredUp, which calls itself the largest online consignment and thrift store, said the motivation for the business was to give people the "easiest way to clean out their closets." 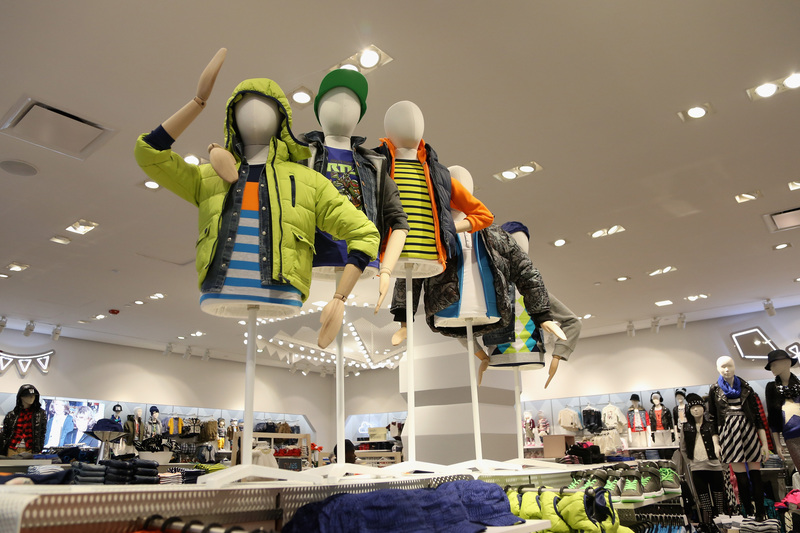 "There is a change in thinking about how consumers buy everything," said Marino. The company, which started six years ago, now offers 25,000 brands and a half a million items on its site. It gets its inventory from customers who clean out their closets and fill a ThredUp bag with women's or children's clothes, which are either sold on the site, recycled or returned to the owner. "It wasn't too long ago when they were called used cars. Now, they are called certified, pre-owned cars. It wasn't too long ago that people took old electronics and put them in a drawer. Now, Apple says send it to us, we'll refurbish it and send it out to the next user," Marino said. "People are taking things that were seen as consumable and turning them into durables." On a smaller scale, fashion companies are introducing lines that incorporate some recycled materials. Patagonia, among the pioneers of this approach, has since the 1990s incorporated recycled soda bottles, unusable manufacturing waste and worn-out garments into polyester fibers to produce clothing. Swedish retailer H&M, which has collected 18,000 tons of used clothes at its stores since 2013, began this year to incorporate recycled cotton from the clothes it collects back into a line of 16 new denim styles. "Creating a closed loop for textiles, in which unwanted clothes can be recycled into new ones, will not only minimize textile waste, but also significantly reduce the need for virgin resources as well as other impacts fashion has on our planet," Karl-Johan Persson, CEO of H&M, said in a statement when the new line was announced. Like the reusable market, there are a growing number of companies targeting environmentally conscious consumers with clothes with organic cotton and recyclable materials - some from unexpected sources. Pharrell Williams, the Grammy Award-winning musician, has designed a line of denim with G-Star RAW called RAW for the Oceans, made with plastic from the Great Pacific Garbage Patch. Aquafil has partnered with Outerknown, a menswear apparel brand founded by 11-time world champion surfer Kelly Slater, to produce a line of jackets and shorts made out of reclaimed fishing nets and other nylon waste. Then there is Dirtball Fashion. Started by former professional race car driver Joe Fox, the North Carolina-based company uses some amount of recycled water bottles, polyester or cotton in all its clothes. Fox says the trail from recycling center to new clothing begins with sorting and washing plastic bottles, which are then ground into flakes that are melted down and extruded to form a fiber. Those fibers are then spun into yarn and the yarns woven into fabric. From there, a "finishing" process dyes and softens the fabric before it gets cut and sewn into a garment. Each of the company's Dirtball T-shirts, for example, contains the material from seven 16-ounce water bottles, while its Dirt Short contains 25 water bottles. And when you don't want them any more, they can be sent back and recycled again. Fox, who started the company in the midst of the recession in 2009, said his goal was simply to make clothes that were "100 percent made in the United States and 100 percent ecofriendly." After rejecting organic cotton mostly because it was being produced overseas, Fox zeroed in recycled cotton and water bottles. "By utilizing that recycled cotton and recycled water bottle in our T-shirts, we didn't have to bleach and dye the fabric," he said. "By doing so, it's a lot easier on the environment. For every 100,000 shirts, we save (916,000) gallons of water ... There were all these cool little things that we were figuring out if we just start changing the way we think about our manufacturing process. " Since getting into the business, Fox admits there is a lot more environmentally friendly clothing competing on the racks. Like some critics of the fashion industry, he has his doubts about the motives behind the big brands' newfound environmentalism. "It pisses me off ... brands that want to act like they do good by the environment when they are really just trying to ride a wave," he said. "It's not like they have their heart and soul in it. Their true DNA is not an ecofriendly, made-in-the-USA or sustainable brand. They still look at the bottom line, their profitability." Cline agreed that many brands are seeing "waste as an opportunity," but she said that wasn't all bad. "People are starting to say not only do I want to design a great piece of fashion that is affordable but I want to think all the way to the end of the life cycle of this garment," she said. But these eco-friendly lines remain a minuscule part of the industry's overall fashion output, a reflection of business models that Cline said are designed to "create too much waste" and the technological limitations and challenges of scaling up the production of recycled materials. Volatile commodity prices also present a challenge. "It's an industry-wide dilemma, for sure, on how do we do something at scale that the industry can participate in," Jill Dumain, Patagonia's director of environmental strategy, said of discussions within the outdoor industry that have gone on for several years over such issues as recycling nylon at scale or concerns about supply chains that go into developing countries. "The end result is that you have smaller-scale production that ends up to be more expensive," she said. "It's harder on your supply chain management people because you are now managing a bunch of little supply chains that aren't very efficient ... It's a lot more work, to say it bluntly." For now, putting a dent in the waste stream will mostly come down to consumers -- many of whom will be rushing out to the malls with holiday lists in hand on Black Friday. It starts by simply increasing the awareness that textiles can be recycled - many people are unaware of the options. But to make a greater impact, a change of thinking may be required -- away from treating clothes like a cheap disposable item you pitch when you're done, and instead, buying stuff built to last for years like our grandparents did. Slow fashion, if you will. "I do think consumption is a big part," Dumain said, adding that consumers and stockholders of clothing companies have the power to get brands to change their ways. "People need to learn how to buy less and companies need to learn how to be profitable in selling less," she said. "A lot of the horrific accidents [in overseas garment factories] are because every penny is squeezed out of every garment. Something has to give. Something has to fundamentally shift in the consumption world that reduces the pressure on the raw materials, which reduces pressure on the planet and reduces the pressure on the people who make all this stuff all over the world."